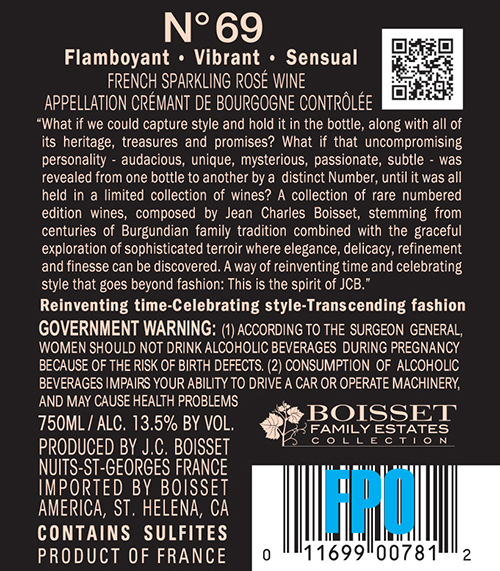 For Jean-Charles Boisset, our dry rosé N° 69 sparkling wine is not a dainty pink thing. It's a FLAMBOYANT, profound mouthful of serious bubbles. The VIBRANT crispness of Nº 69 is thirst quenching. Yet the flavors—evocative of pinot noir—are beautifully SENSUAL. Vibrant aromas of raspberry and red currant evolve into aromatic jammy notes. N° 69 is a seductively light and refreshing rosé. This wine is tender in the mouth with crisp flavors. This rosé is made in the saigneé method by carrying out a short maceration of Pinot Noir from Burgundy’s côtes.